For over 20,000 years, people have been using wheels to find their way through life. Based in parts on the native American medicine wheel, the Hindu chakravartin ‘wheel of law’ and the Chinese lo pan compasses, the Wisdom Wheel can guide you through your own personal spiritual inner journey. DISCOVER YOUR BIRTH LAW FOR FREE! 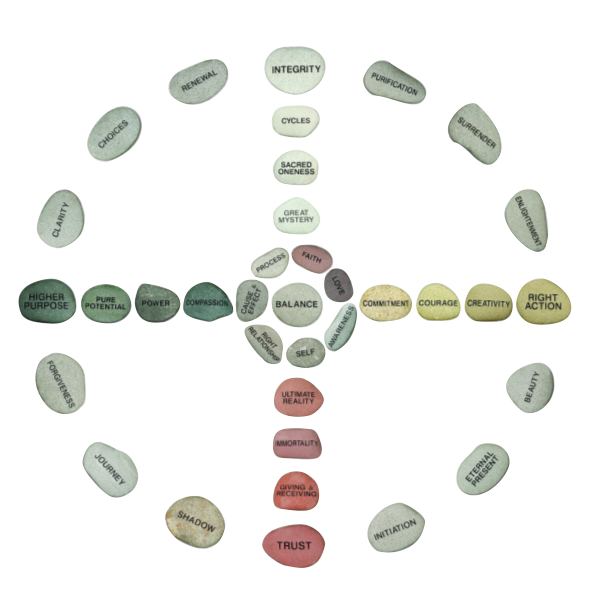 Together, the 36 individual stones or “Universal Laws” of the Wisdom Wheel identify the common ground of values, such as Balance, Compassion, and Enlightenment, that unite the world’s cultures, religions and countries. Please consider donating in order to support the Wisdom Wheel! Using the Wisdom Wheel as our map, we explore each of the 36 Universal Laws. Through conversations, books, videos, events, and more, we visit each quadrant — mental, emotional, physical and then spiritual — to study the Law from all sides while we consider different perspectives and extend our views of the world. Check out our free introduction for a breakdown of the Wheel’s many layers of interpretation and its applicable wisdom. The journey begins with the Law of Balance and ends with the Law of Great Mystery. And then, it starts all over again! As with most spiritual practices, the Wisdom Wheel insists on commitment, as we all learn how to live more meaningful lives. From Christianity to the Muslim hajj, making a pilgrimage is an old tradition, and even in modern times, we can still benefit from our own deliberate and dedicated journeys, no matter our background, religion or stage of life. Wisdom Wheel facilitators, students and study groups meet regularly, in person and online once they have joined a class. We also regularly host workshops, retreats and events, designed to deepen our personal spiritual journeys while relating, connecting, and benefiting from the support of our groups. With a growing number of facilitators teaching our three year classes, we also organize hour-long presentations, day-long events and custom-designed retreats. The Wisdom Wheel’s developer, Cynthia Davidson, is also available for speaking engagements and workshops. For inquires, please email wisdomwheelwoman@gmail.com.